Three former Louisiana high school wrestling girls, now matriculating at colleges or universities in Georgia, Oklahoma and Texas, placed in the top three spots at the Oklahoma City University Blue Chip College Open. And it took the best of each weight class to keep the now young ladies ("girls" do not matriculate) from winning their weight classes. Abigail Nette of Emmanuel College placed second in a 4-4 finals match determined by criteria. Brittany Bates of Wayland Baptist University placed third, as did Raven Guidry of the host Oklahoma City University team. Guidry is listed as wrestling for the Aries Wrestling Club (a USA Wrestling Club associated with Oklahoma City University) while her coaches decide if she competes well enough to earn a spot on the final OKCU roster or if, due to her curriculum choice, they choose to "red-shirt" her. Placing in the pool rounds determined in which bracket (1st-8th, 9th-16th or 17th-24th) one participated on Saturday, but did not have much, if any, effect re seeding. Miss Nette won her pool round and was placed in what normally would be a #4 seeding spot, which was fine. Yet Miss Bates also won her pool and was placed in what would normally be a #7 seeding spot. Miss Guidry had more Friday match wins (not including byes) with two, and was placed in the #8 spot behind wrestlers with only one win on Friday. Yet there was order, as the seeding went alphabetically and then numerically, by the pool name and placement, i.e., the winner of Pool A received the #1 seeding spot, and the second-place finisher in Pool A was placed in the #2 seeding spot, etc. Being the second-place finisher in Pool D, Miss Guidry was placed in the #8 spot. No matter. Abby beat her "seeding" by two places. Brittany beat hers by four and Raven beat hers by five. On Saturday, each young lady only lost one match, and for all three it was to the eventual winner of the weight class. Miss Guidry's loss on Friday was to the runner-up on Saturday. Placed second at 130 lbs. Abby won Friday's Pool B, scoring technical falls of 10-0, 10-0 and 12-1 while also receiving two byes. 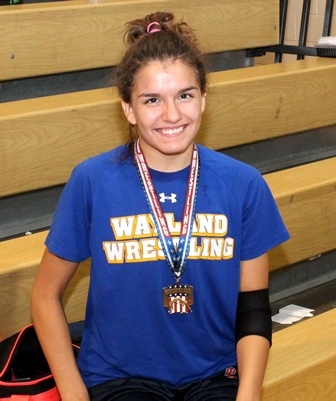 In the championship bracket, Abby advanced to the finals with two 10-0 technical falls and lost in the finals via criteria in a 4-4 match with Alexia Ward of McKendree University of Lebanon, Illinois. Abby was the only competitor at 130 lbs. that Ward did not defeat via a 10-0 technical fall. Placed third at 143 lbs. 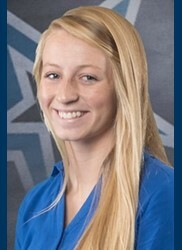 Brittany won Friday's Pool, posting a 5-0 record with falls in 1:19, 3:36, 0:12 and 1:25, while also receiving a bye. On Saturday she defeated Emmanuel College's Astrid Silva by a 13-2 technical fall before falling to eventual champion Cassandra Herkelman of McKendree University via a 10-0 technical fall. Advancing to the consolation semifinals via her appearance in the championship semifinals, Brittany defeated Marilyn Garcia of California's Menlo College after Garcia was forced to withdraw due to an injury after 1:36 had elapsed in the match. For third place Brittany pinned Isabelle Fuentes of McKendree University in 2:14. Placed third at 109 lbs. Raven placed second in Friday's Pool D. She scored falls in 3:23 and 0:26, received two byes, and lost via a fall in 2:08 to Vanessa Ramirez of McKendree University. 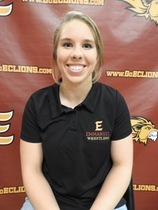 On Saturday she lost her first match via a fall to Cody Pfau of the Lion Wrestling Club (USA Wrestling club associated with Emmanuel College) in 1:07. She next won a 13-11 score-fest against Wayland Baptist's Rhonda Johnson. In the consolation semifinals she pinned Allissa Maldonado, of the McKendree Bearcats USA Wrestling Club, in 30 seconds. To take third Raven scored a 10-0 technical fall over Ottawa University's Valeria Rivera. Emmanuel's next matches are a weekend of tri-meets. On Friday, October 27th, they face Campbellsville University and Brewton-Parker College in Campbellsville, Kentucky. On Saturday, October 29th, they will compete against the University of the Cumberlands and Missouri Valley University in Williamsburg, Kentucky. Wayland Baptist's next match is a dual meet at Lyon College in Batesville, Arkansas. Next up for Oklahoma City University is the Dave Schultz International in Colorado Springs, Colorado, from November 1st-4th in Colorado Springs, Colorado. The women's events will be held on November 2nd and 3rd. Emmanuel College and Wayland Baptist University are also schedule to participate in the event.